Contracted by Halliburton Egypt, GENERON has manufactured and supplied a series of six portable, containerized, 5500 gallon Fuel Tanks. Each fuel tank is capable of supplying up to (4) 1500 scfm air compressors, operating at the same time. 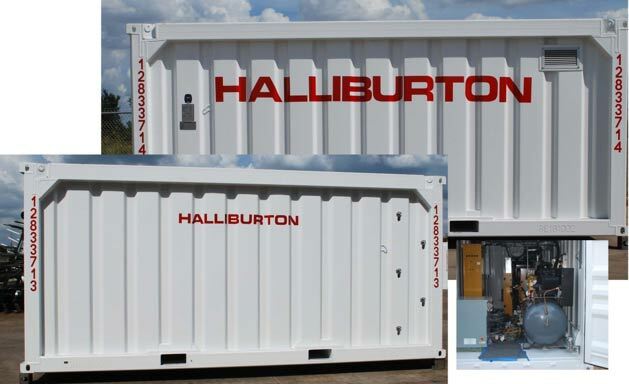 These will be used on pipeline integrity projects and various other Oil & Gas field applications. These DNV certified frames are designed and built for offshore certifications, as well as for onshore use. These GENERON fuel tanks are equipped with selector pumps for filling and supplying pressurized fuel to compressors or other equipment, and can be designed for Class I Div 2 service. The fuel tank housing is a 20’ x 8’ x 8’6” DNV 2.7.1 Container, which GENERON builds and certifies at their Houston, Texas facility. For further information on GENERON or the IGS Companies, please contact us through our website @ www.generon.com.